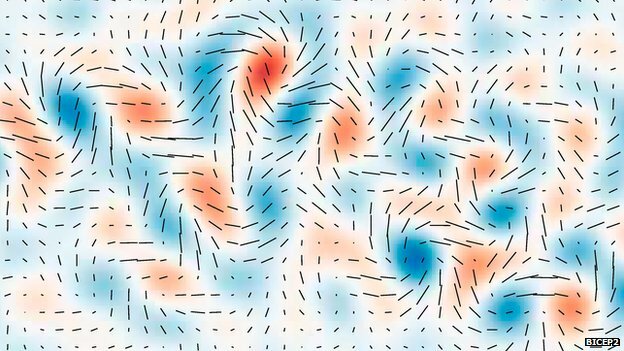 The tell-tale twisting pattern in the polarization of light from the CMB, caused by the ripple of gravitational waves a tiny fraction of a second after our Universe came into existence. Today I would just like to clear something up in case any of you were confused by some of the media coverage of yesterday’s thrilling result from the BICEP2 experiment. The result appears to show the fingerprints of gravitational waves imprinted on the cosmic microwave background (CMB) radiation. However, many news sources (including The Guardian and CNN) reported this as the first observational evidence for gravity waves.